SKA Organisation Headquarters, 18 March 2019 – SKA Organisation Project Scientist Dr. Evan Keane has been awarded the European Astronomical Society’s (EAS) 2019 MERAC Prize for Observational Astrophysics, in recognition of his work on radio transients. 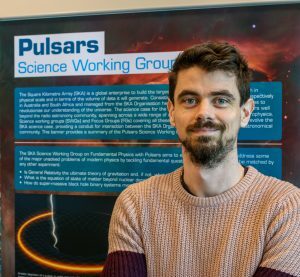 The prize, which is for early career astrophysicists, was awarded for Dr Keane’s investigations of the Transient Radio Sky and the discovery in 2011 of the second “Lorimer burst”, now known as fast radio bursts (FRBs) – powerful millisecond flashes of radio waves emanating from deep space. Dr. Keane joined the SKA Organisation in 2015, and his research focuses on searching for radio transients and using them to understand fundamental questions of physics. The EAS noted that Dr. Keane has made significant contributions to developing and improving techniques to discover new pulsars, and determined timing solutions for challenging pulsars. He was part of the team that discovered the first Galactic Centre radio pulsar, and he did the first systematic analysis of all known FRBs, precipitating the Fast Radio Burst Catalogue (FRBCAT). Read more on the European Astronomical Society website.